A new year is an exciting time to think about what you enjoyed about the last year and those things that you want for the new year: to think about what worked in the past and what wasn’t as effective. Many homeowners in Watauga and the Dallas-Fort Worth area consider starting a kitchen remodel with the start of the new year. If you are thinking about remodeling your kitchen this year, there are a few things that you need to consider when thinking about keeping or replacing your appliances. 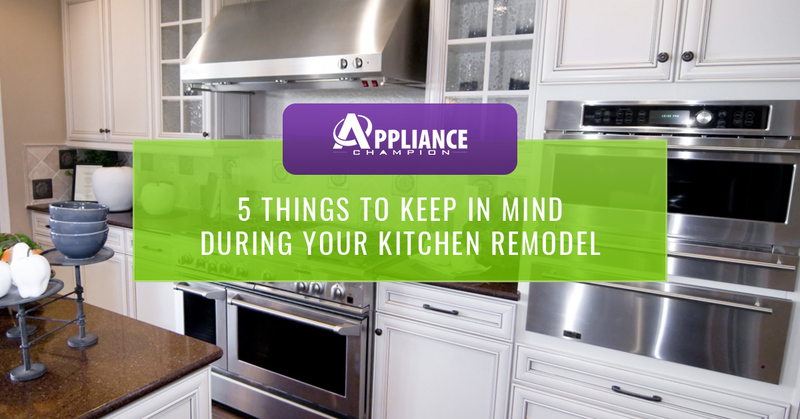 Keep reading to learn more about having a successful kitchen remodel and be sure to call Appliance Champion for their Top Rated Local® appliance repair services. We offer dishwasher repair, microwave repair, refrigerator repair, and more. Visit our website to learn more about our five-star performance and to schedule with one of our factory-certified techs. Often the question when thinking about remodeling a kitchen is “should I repair or replace my appliances?” It can be easy to assume that the best option is to replace them all, but if you are operating on a budget and may not be able to replace them, this is a viable question. Today, we will consider those factors that can ultimately help you make this decision. What would I benefit from the most — for example, more counter space or a bigger fridge? If I have to replace my appliance within a few years, will it fit within the remodeled space? Can my current appliances fit into the desired design? Can my current appliances integrate into current installation methods? How do my current appliances serve my needs and how could a new design better serve me? What would benefit me the most — investing in new appliances that are more energy efficient or keeping the ones I have? How does replacing appliances fit into my budget and what I want for my remodel ROI? It’s also important to consider gas appliances versus electric; during a kitchen remodel it can be beneficial to think about if you would like to convert over gas or electric. Many home chefs prefer to cook with gas. However, electric appliances provide many advantages and tend to be the more popular option. As you consider this aspect of your kitchen remodel, it is important to think about the implications on the rest of your house: if you convert to gas, for example, you many want to convert other appliances and elements (water heater, dryer, and furnace to gas). How would this benefit you financially? Do you desire a change? Could converting over mean a bigger return if you decide to sell? Another aspect to consider is the range, oven, and cooktop debate. Homeowners remodeling in 2019 have many options to consider — which means that you can have a kitchen that truly works with your kitchen cooking style and needs. Homeowners will need to choose from options regarding their stove/cooktop, oven, and range. Not only will you have to think about options such as a cooktop with traditional electric burners versus a ceramic top, but also new options such as steam oven which serious home bakers and chefs, and even foodies are opting to install. What appliance configuration suits my needs the best? What will provide the highest ROI on the investment of a new configuration? Will I actually use these appliances and is the investment worth it for my home? Whether you choose to install all new appliances or keep the ones that you have, Appliance Champion is here for you! We are certified to work on appliances old and new. Visit our website to learn about our services and how we can help you keep your kitchen up and running at it’s best. Make a same-day appliance repair appointment with us! New Year, New You, and New Appliances?